Soundcloud, Podomatic, Podbean, Archive.org and many more. In the world of audio hosting sites there are a wide variety of options available of journalism programs in 2018. Our staff opted to go with Podbean for our podcast hosting needs back in 2014, shortly after joining SNO for our web hosting needs. In surfing SNO’s help site they suggested Podbean as the hosting site, which prompted me to go with it for a year knowing that if our staff didn’t like the interface we would be able to go another route in the near future. However, after four years with Podbean we are very happy with the services they offer. 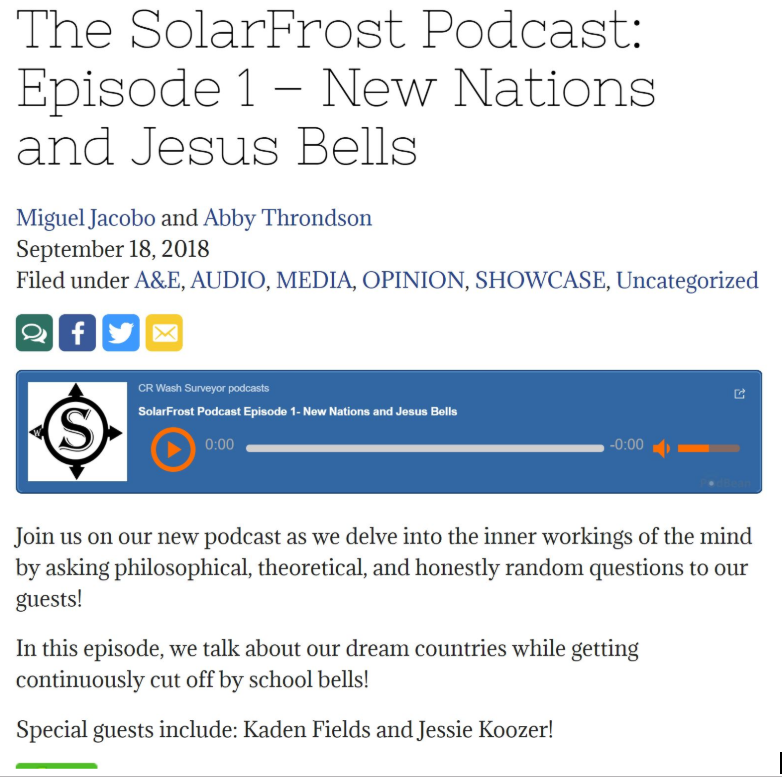 Podbean has a very easy to use interface on the backend, with an upload page that looks very similar to what students who have used WordPress (and SNO) would be familiar with. If your staff has experience uploading any type of files to a CMS site then uploading completed audio files to Podbean will be easy. 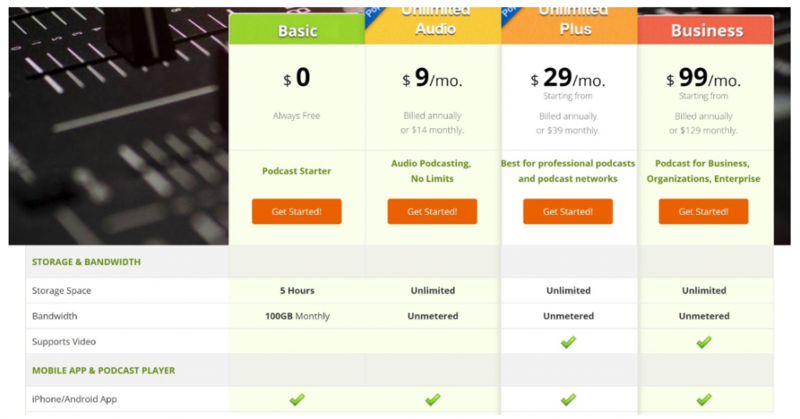 Podbean is now $108 per year for the unlimited audio plan, which will allow you to hold on to all of your uploaded podcasts. If that is not a concern for you than going with the free plan allows you to store the most recent five hours of podcasts and upload up to 100 gigabytes worth of data each month. However, staffs that are able to embed advertising into their podcasts, or read ad copy from local businesses, should be able to recover that cost. These are the four plans that Podbean now offers. The plan we have utilized in the past is no longer offered and my staff will likely be switching to the unlimited audio plan for the 2019-2020 school year. One thing my staff likes about the Podbean website is the ease of seeing statistics, both from the life of our account and recently downloaded episodes. Utilizing these statistics can help guide staffs towards what type of content their listeners are drawn towards, which can help guide future episode content. Podbean allows you to see when you received the most traction during the last three months of uploads. You can see your 10 most downloaded episodes from the last three months, with an unlimited plan you can dig even deeper into your podcast statistics. 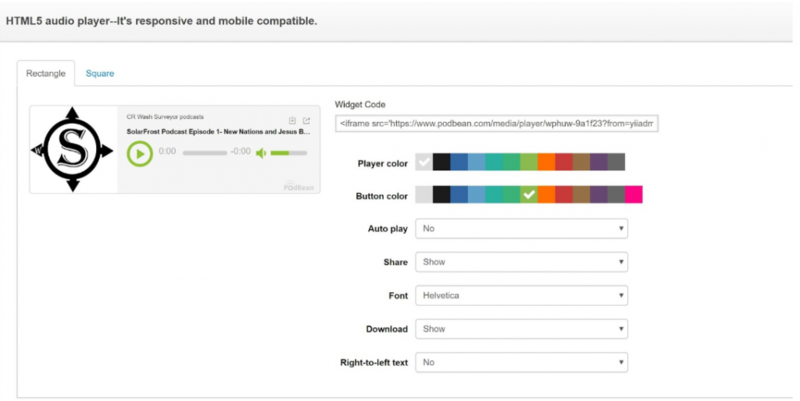 Podbean offers a variety of customization options for your podbean homepage via free themes (again, similar to WordPress for staff’s familiar with that CMS,) and the player which staffs can embed on their website. The web player customization allows users to change color, font, and the shape of the player. Because SNO had recommended Podbean early on they are able to provide tech support in the event that the embed code does not work properly the first time. For staff’s that don’t utilize SNO there is a podbean support center as well. This is what the player customization screen looks like. This is what the player looks like when embedded on a SNO site. 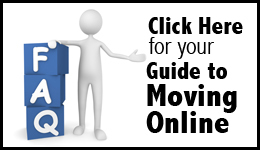 You can also opt for a square player and change several things about the look. Finally, Podbean makes it easy to share podcasts through a variety of social media as well as creating an RSS and/or iTunes feed. For staffs new to hosting via iTunes, Podbean provides a video that walks them through everything they need to do to get their podcast hosted on one of the most popular podcast players today. After four years, and very intermittent use, I am happy that our staff opted to go with the Podbean hosting service back in 2014. For those looking to get started I’d recommend trying the free plan, which should allow for seamless integration into a paid plan if Podbean is right for your staff.